This tree often branches close to the ground and thus most specimens are multi-trunked. It is also common to find seedlings germinating epiphytically on other plants. It has a vigorous root system and should not be planted close to underground pipes. The leaves are compound with 7-16 leaflets radiating out from a central point, each leaflet has a glossy upper surface. The flowering spikes radiate out at the top of the branches like spokes in a wheel and these bear numerous small umbels of red flowers which are followed by fleshy red berries. 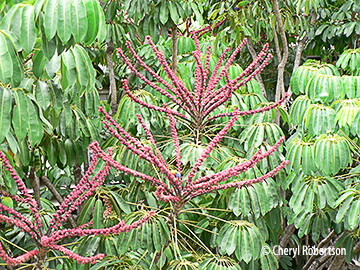 Nectar rich, the flowers are bird pollinated and the fruits are eaten and the seeds dispersed by birds. This species has the potential to become an invasive weed.